Multisense Realism proposes that the cosmos is an involuted, reflexive, tessellated or ‘Ouroboran Monism’ – a non-neutral monism in which experienced presence defines itself by the projection of its own pretended absence. What is proposed is a universal sense which modulates itself through various kinds of insensitivities; delays, maskings, distortions and diffractions. Such insensitivities or entropies, are, in their purest form, what we know to be space and time. To be clear, time is not clock time (which are measurements of spatial changes in public physical phenomena), but rather the sense of narrative sequence, of evolving stories which spiral or gyrate thematically rather than merely repeat. It is thorough these nested diffractions of experienced sense that matter and energy can be understood as alienated experiences – experiences which have become unfamiliar to each other on some level over the history of the universal diffraction. Changing experiences synchronistically express different faces of eternity. intentional-voluntary causality, aesthetic and immeasurable qualities. 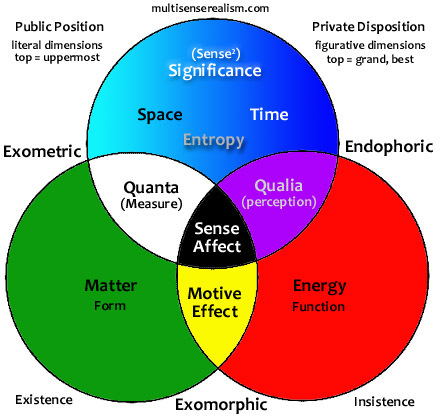 The above diagram emphasizes the interplay between matter, energy and spacetime as functions of the diffraction of sense into qualia (personal sense), quanta (impersonal sense) and motive effect (projective sense from the personal to the impersonal). 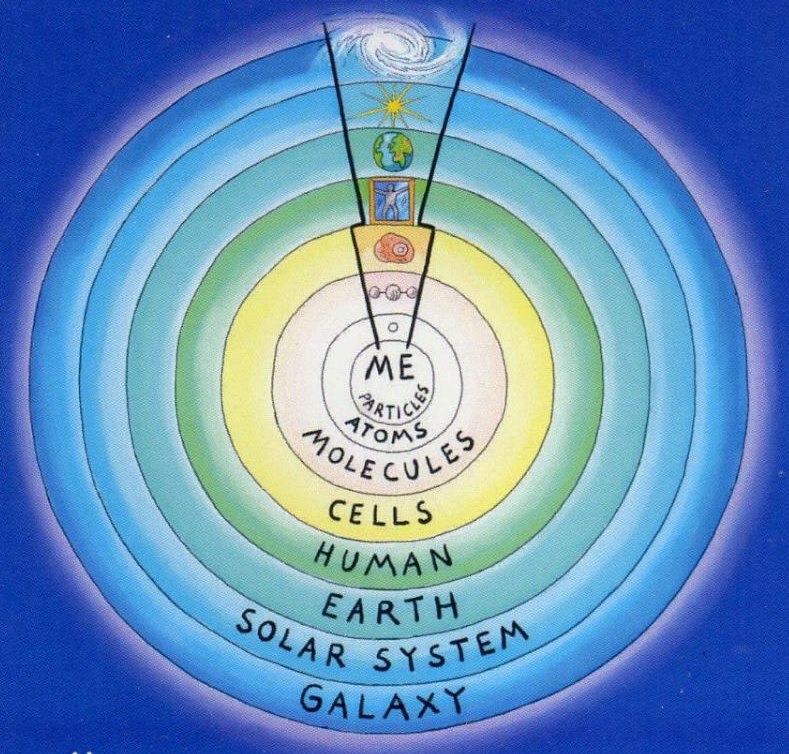 This is an alchemical type of diagram which contrasts concepts and essences. Below, the the same pattern is expressed in a hierarchical view by scale of size and frequency. 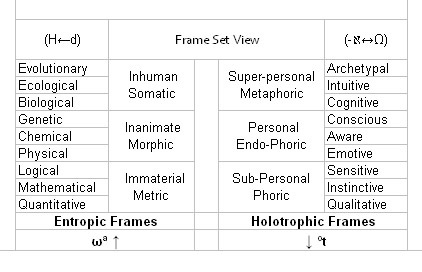 The left hand columns describes the “Entropic Frames”, so called because they are governed by entropic tendencies of matter as it cools and scatters across public space. 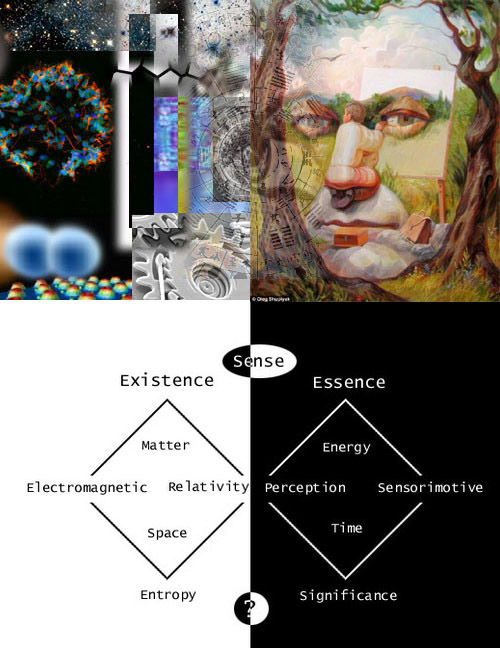 We call these phenomena ‘physics’, but under MSR, physics cannot be considered completely separate from consciousness. Our feelings and thoughts drive our actions and our actions are reflected as changes in our brain, body, and external world. MSR generally follows a convention of placing the public-physical aspects of nature on the left side of diagrams, in keeping with the sense of material science being associated with the geographical-historical-cultural turn to the West. Mainly this makes it easier to keep things straight, as it is a reminder of the West as a turning away from the naive orienting principle of subjectivity and toward a skeptical outlook of scientific exploration. The left hand column is the column of ‘disenchanted’ objects, ranging in scale from atoms to galaxies. At the top, (H←d) represents the relation between distance d and entropy H as one where distance extends in one direction only, so that H← reiterates the second law of thermodynamics. The idea here is that entropy is only ultimately half of the total picture of nature; the half in which pubic experiences are reflected as matter, and also as entropy perpetually and irreversibly grinding down all coherent structures and functions into into incoherence and indifference. Entropy has become a rather ambiguous term in recent years. It is used in a variety of informal ways, but also in formal ways that overlap either partially or completely within physics and information science, depending on who you ask. Shannon entropy is a statistical measure of how resistant information is to compression. Thermodynamic entropy is a physical measure of how physical differences such as pressure, density, and temperature always tend to average out toward an equilibrium over time. There is a crossover between information entropy and classical entropy in that higher temperatures, for example, require more information to be completely described than lower temperatures. It is easier to compress the description of an ice cube crystal than it is a cloud of steam. 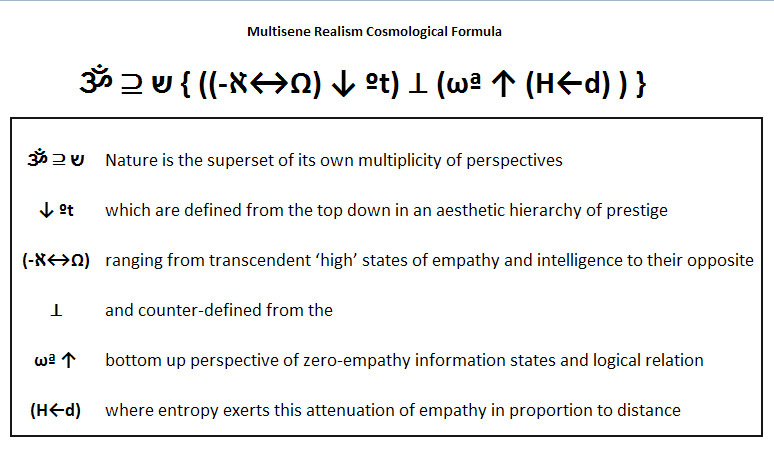 Because MSR is focused on perception however, a new kind of aesthetic entropy must be introduced. If we were to make a video tape of a glass of ice melting for example, it would actually require more information to remain uncompressed in an mpeg to describe the image of the ice in its various states of melting than it would to record the glass of still water that ends up sitting there after all of the ice has melted. The transition from measuring microstates of water molecules to measuring optical states of a moving image actually reverses the relation between thermodynamic entropy and information entropy, so that the image of still water has a lower information entropy (more like English than Chinese) than the image of melting ice. Here we can consider another example where the quality of perception plays a role in entropy. To someone who does not read Chinese, all Chinese characters may seem indistinct. Like the language which Charlie Brown’s teachers speak, communication which is not understood can still be communicated about, but the content of the message is obscured. In a game like Pictionary or Charades, people who can read no Chinese can communicate with each other that a message is in Chinese simply by drawing nonsense characters which they know will remind the other person of Chinese writing. A common stereotype can be called forth with low entropy gestures, even though what is being stereotyped is high entropy such that the shared ignorance of the Chinese language serves to reduce information entropy. This ties in with Searle’s Chinese Room. We can translate the entire thought experiment in terms of a high entropy conversation going on outside of the room which is being facilitated by a manipulation of low entropy images (really mechanical functions) inside the room. The man inside the room only needs to match up logical-syntactic relations, so that even with a ‘systems reply’ view of the room, the Chinese speaker outside of the room is required to add the additional semantic information. These examples are only the tip of the iceberg which MSR hopes to melt by recognizing that perceptual sense and cognitive sense-making are the ultimate factors in defining entropy. Rather than being a fixed constant ‘out-there’, MSR models entropy as an intrinsically integrated relation between differing frames of perceptual reference. The measurement of microstates is, after all, a very recent technology for us, and we should not conflate the seeming objectivity of our measuring instruments with the assumption of perception independence. We still only know what our instruments can tell us, and our instruments only know what they themselves are able to detect and record. Under MSR, low level physical states are so distant from our own high entropy quality of awareness that our instruments may also be amplifying our biases. Physics may seem to be a low entropy language of generic mathematical relations, but under the MSR Cosmological formula, that is exactly what we would predict from this ‘Stranger in a Strange Land’ view of matter that we have as human beings. Even though our science can translate the Chinese of physics into English it is still only the English version of stereotyped Chinese which is being considered. The remaining semantic content of the cosmos is not only truncated into the unknown, but because we are not aware that anything is missing, the really important stuff becomes an unknown unknown, hidden behind a mirage of causal closure. Within MSR entropy is understood to be a symptom of insensitivity, the loss of empathy that corresponds to ‘distance’ in the literal and figurative sense of the word: Alienation, separation, objectification, and unfamiliarity. Originality and uniqueness dissolve into generic stereotyping, or at least it appears that way on this Western side of the cosmic balance sheet. From an information entropy perspective, d would be understood as the mismatch of perceptual frames of reference. Distance is degradation of sensory unity. The conjecture here is that it is this loss of sensitivity which leads to perceptions of noise and insignificance, but also to the specialization of sense into distinct modalities. It is proposed that the magnitude of this mismatch increases logarithmically, leading to the breakpoints shown as the horizontal bands on the frame set chart above. What is perceived as empty space to us on the macro scale is the summary of sensory gaps on lower microphysical levels that fall beneath the threshold of detection of ourselves and our bodies. H←d is the attenuation of perceived significance and also depletion of autonomy or motive. Things appear to become more automatic and mechanical from a distance. A city seen from the air for instance, does not seem to contain people who we can relate do directly, but rather it appears more like an ant colony, with cars and pedestrians being diminished to an almost equivalent image. This sense of the world as a toy brings up the relation of size in our psychology. Childhood would be very different if we were born as giants and gradually shrank to human size. Our capacity to relate to things and people has a lot to do with scale. Sci-Fi films from the 1950s played on the monstrosity of ants and flies when blown up to an enormous scale. 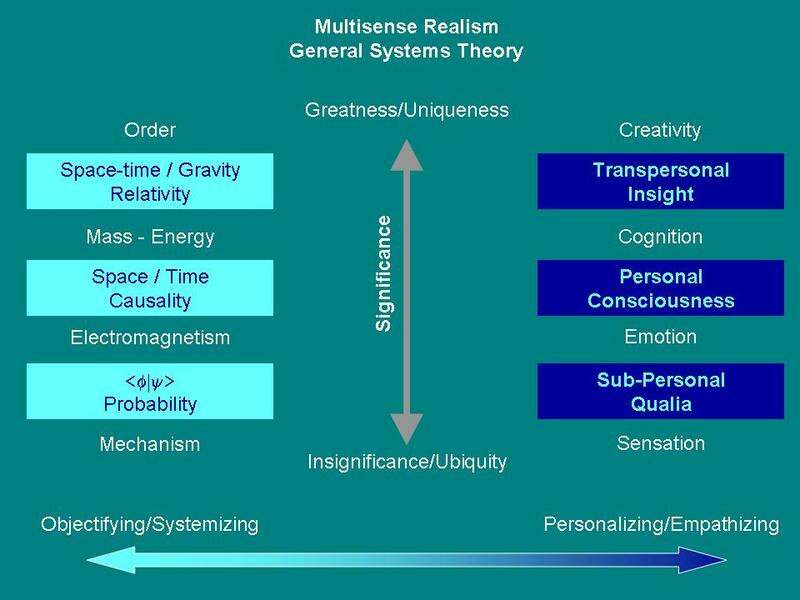 This whole area of scale, distance, empathy, and significance is strangely overlooked in philosophy of mind, but MSR places it at the very center of what and how objectivity arises as the inversion of boundaryless subjectivity. At the bottom left of the chart, ωª ↑ denotes that frames on this Western side of the chart are controlled by bottom-up determinism, and that they nested within each other by telescoping scales of physical size. The nesting is represented by the symbol ‘ª‘. The intent here is to refer to the literal hierarchy of material forms and functions, from the microcosmic to astrophysical, as well as the immaterial principles of logic and geometry which are in some sense being embodied as matter. The causal sensibility of this hierarchy appears to be governed by blind indifference and maximum insensitivity is represented by the bottom up (↑) arrow. This is the arrow of unintentional effect, of the mechanical motive to do purely for the sake of doing. In MSR, the entire Western conception of the universe is reduced to this part of the formula: ωª ↑(H←d). Note that in the Cosmological Formula being discussed here, the Western half of the formula actually appears on the opposite side as the charts…which is a function of formulas being Western and read left to right. Confusing, but there is some historical influences coming through there that seem to want to be preserved. In the previous “Western” half of the chart, the public half of the universe is seen to be constructing itself probabilistically without effort or awareness. This type of passive causality is known as teleonomy and is the motor of natural selection. Teleonomy is the reverse of teleology in that whatever evolves does so because of inevitable patterns that happen to accumulate over time rather than by conscious intention and planning. This type of causality is exemplified in Laplace distributions, Brownian motion, etc. Randomly moving particles in a void is the very embodiment of the bottom of the left hand column of the chart; the lowest possible ª of ω. (lowest structural level of automatic quantitative forces). In direct contrast to this quantum mechanical picture of the universe decomposed to boiling bits, the perspective of the self is defined by teleology and stability in the face of change. If anything, human awareness resembles nothing less than a collection of randomly colliding particles. Our awareness is presented not as a container of objects in space, but an semi-contained ‘stream’ of phenomenal subjects. The natural or naive perspective had become so alien and repugnant to science in the previous two centuries that it is still challenging to overcome the stigma. There are good reasons why this is the case, but they are not purely scientific reasons. To the contrary, the disqualification of subjective phenomena has more to do with psychological bias. What began as a perfectly valid concern for rigorous controls in the scientific method has, in some cases, become an ideology of cynicism which does not reflect an interest in objectivity, but rather is an emotional reaction to the frightening unreliability and potential for fantasy inherent in personal awareness. A more neutral position would be to acknowledge that subjective phenomena are every bit as likely to contain valuable information about the universe as any other phenomenon, but that information has been problematic to gather thus far. Even if subjectivity only presides over a hopelessly distorted fisheye lens view of the world that scarcely connects with science, the phenomena that it contains is every bit as defining of nature as physical laws. In the realm of subjectivity, the hard problem of consciousness is no problem at all, and dreams merge surreal landscapes with mind-bridging metaphors. The problems of philosophy are resolved in dreams already, we have only to understand how dreams might have made themselves more real through spatial and temporal extensions. In the 21st century, with Relativity and the Observer principle of quantum mechanics behind us, it is time that we begin to factor in subjectivity on a deep level into our cosmology. We should recognize that all functions of physics and mathematics begin with the unacknowledged presence of an observer or participant in the process. The ‘observer’ in physics is treated as a single abstract point of view or frame of reference which has no properties except to localize some function. With relativity, Einstein saw that the presumption of a single omniscient observer was only a theoretical device, and that observer-dependent perspectives are actually critical to defining physics. No longer a fixed Newtonian clockwork, relativity provided real evidence for frames of reference within the fabric of the universe itself. It is my contention that General Relativity did not go far enough, and that subjectivity is not only a real feature of physics, but that the underlying context that subjectivity is based on is the primary feature of all of nature. The fact of subjectivity as an aesthetic-participatory phenomon literally changes everything, and the universe which contains even a single sensation is, according to MSR’s cosmology of the Sole Entropy Well, the only universe that has ever been or can ever be. Physics exists within sense, not the other way around. 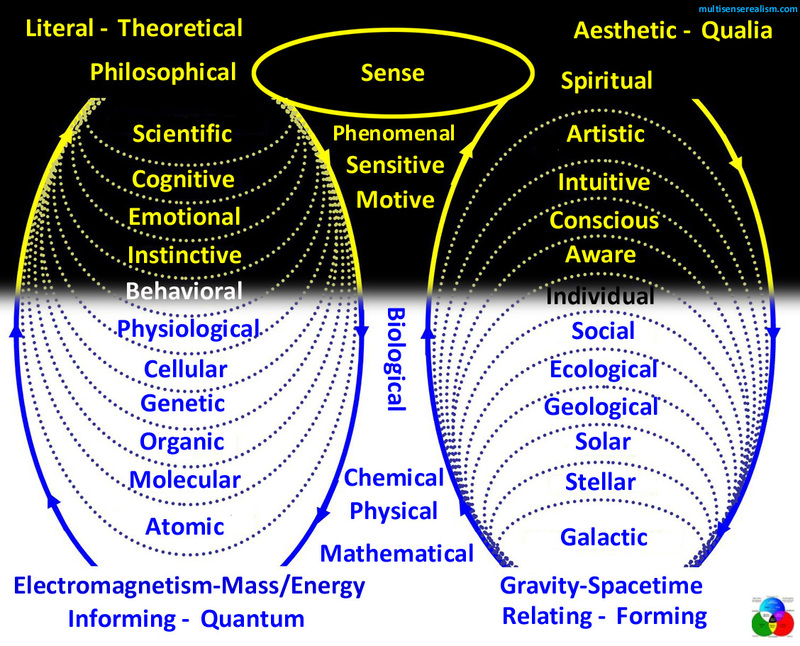 The guiding principle of this Eastern, ‘Orienting’ half of the chart then, is not result of the Western half of matter in space, but is instead the foundation beneath all matter and public appearances. The right hand column is not an epiphenomenon of ωª ↑ but it is the top down principle of (↓) of telos and time, ºt, which precedes all spatial extension. The implication here is that before there was unintention, there was intention, and before there was intention, there was sense (-ℵ). The symbols “-ℵ↔Ω” tell the story of sense and motive, oscillating beyond time to create experiences which in turn create the experience of ‘time’. “-ℵ” plays on the use of Aleph numbers to denote infinite cardinality in mathematics. In MSR, negative Aleph stands for the underlying coherence which precedes cardinality. It is the same as pansensitivity (ॐ), only the -ℵ specifies the aspect of pansensitivity which is like the womb of all information and structure. Pansensitivity is the totality of feeling and experience, but sense is the localization of that universal sense to accommodate discrete, nameable identities. Sense can be thought of as the ‘phoric’ principle, the carrying or ‘ference’ of sensory presence and sense-making ‘references’ or ‘representations’ (all of which are cardinal identities or particles of ℵ) . The “º” glyph is the masculine counterpart to the feminine ordinal symbol “ª“, emphasizing the hierarchical nature of experience isn’t borne of passive accumulation of structures in space, but of an active striving for improvement of experienced qualities. Rather than distance and entropy, phenomena on the right side is governed by the opposite principles; preferential distinction, perceptual participation, and motivation by both promise (positively charged significance º) and threat (negatively charged significance º). Just as the universe has developed different frames within which the drama of existence takes place, MSR speculates that every experience in the universe is part of a single overall experience. This proposed absolute perceptual frame, which is pansensitivity (ॐ), stands for the Absolute, or Totality, but has many other names in mystical and philosophical traditions, including Brahman, Tao and Ein Sof. The Ankh sign is related as well, but for those who are not interested in such concepts, the Absolute can be understood simply as ‘Eternity’. The Cosmological Formulation specifies how pansensitivity (ॐ) diffracts itself reflexively into an increasingly tessellated, self-modulating spectrum of aesthetic contexts. Refers to the Absolute, aka pansensitivity. The Om symbol is used here to pay tribute to philosophical traditions of the Absolute or Totality which go back thousands of years, however the point of MSR is to go beyond past conceptions of the Absolute as merely the ineffable ‘all that is’, or ‘love’, ‘energy’, ‘Being’, ‘Brahman’, ‘Tao’, God, etc. Under MSR, ॐ is a comprehensible phenomenon: Primordial identity pansensitivity, aka the aesthetic foundation of the multisense continuum. The ‘superset’ sign is a good way of describing the relation of ॐ to the diffracted parts of itself. The diffraction of ॐ into the spectrum of the multisense continuum ((-ℵ↔Ω) ↓ ºt) ⊥ (ωª ↑ (H←d) ) is referred to in the formula with the symbol ש as an homage to the Kabbalistic concept of tzimtsum. Tzumtsum is the primordial cosmic fragmentation, perhaps the original ‘Big Bang’ or Big Shatter concept. In one way, personal sense is identical the Absolute, since any consciousness is infinitely more conscious than unconsciousness, and will is irreducible regardless of how small its area of effect is. In another way, however, there is a difference between the limited ‘omnipotence’ that we experience within the privacy of our own thoughts, and the unbounded omnipotence of the totality of creative power. In this way consciousness or sense is always absolute within its own frame of reference, but the multiplicity of frames of awareness exerts a kind of gravity of realism that imposes more and more limits on personal awareness relative to the absolute. This mereological confusion of ‘relatively absolute but not absolutely relative’ comes across in a lot of theology and mysticism, were we might hear concepts such as, in the words of Michael Palin “The indivisible oneness of the Trinity”. This is not meant to be mystical or even dialetheistic, only an accurate description of nature’s fundamental semi-non-orientable orientation. All experiences contain within them the influence of all other experiences, and yet none of them contain anything completely but their own. The Supreme Monad isn’t windowless, it is the window-maker. “-ℵ↔Ω” refers to the total range of conscious states; a spectrum of aesthetic richness of perspectives, modalities, and meanings. Here, the negative Aleph symbol (-ℵ) refers to the most transcendental state of consciousness in which personal awareness appears fused and filled with the significance of the Absolute. 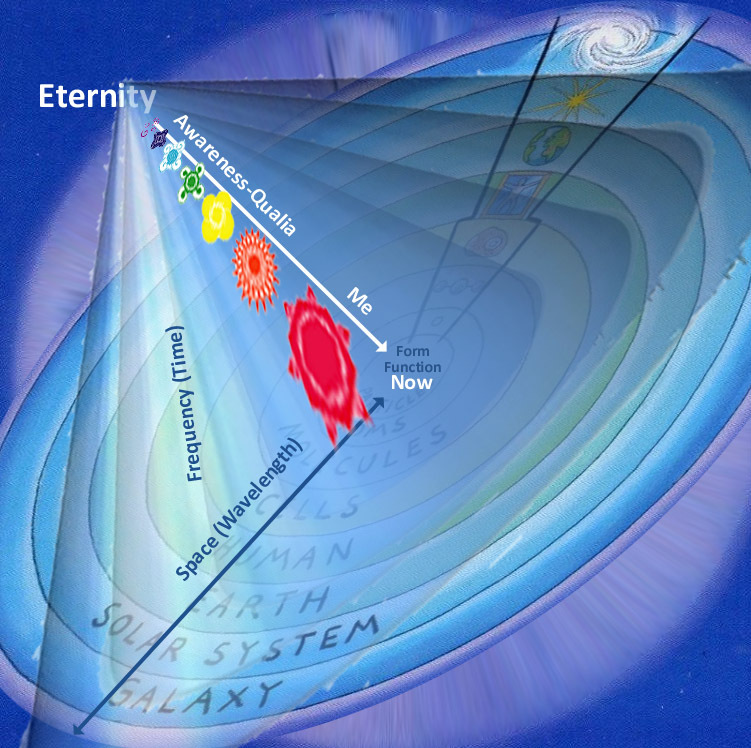 The presence of eternity is experienced as aesthetic saturation, Nirvana, bliss, the White Light, etc. This transcendent state, in which the ‘psychic aperture’ is wide open, permits the significance of all separated perspectives to harmoniously fuse. The Omega symbol (Ω) represents the Left Hand, worldly reflection of this transcendent level of awareness, something akin to genius. Solving a mathematical problem for the first time or making a major scientific discovery is the Western version of Heaven, where discipline and devotion pay off as visionary achievements for the advancement of civilization. Where –ℵ is personal identification with the trans-rational dimension of Absolute wisdom and empathy, Ω is the impersonal rapture of pure intelligence and hyper-rationality. 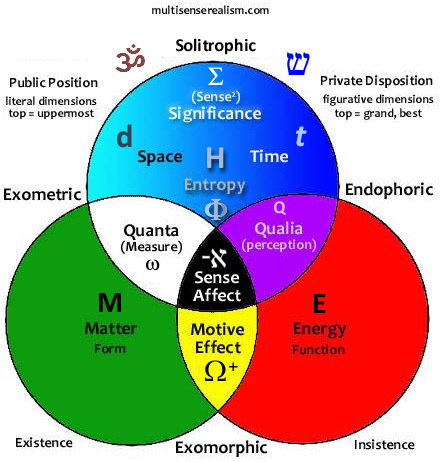 If -ℵ is the underlying sense of sense that waits behind all sensations, feelings, and intuition (semaphores, phoria, and metaphor) then Ω is the sense-of-logic that drives all problem solving algorithms, formulas, and theory. Getting back to the frame set chart above, we have now moved over from the left hand Entropic frames to the right hand Holotrophic frames. Rather than grinding down toward heat death, the Eastern side is perpetually springing up, metaphorically to greater and greater aesthetic heights. The MSR theory of time (t) proposes three qualitative gears of time rather than a single dimension of duration. The symbol º here refers to the evolution of the quality of experience through time. In the low levels of aesthetic development, time is simply a comparison between a perception of change compared with another unchanging perception. This monotonous sense of time gives way to the sense of oscillation, then cycling, then steps in a cycle, and finally a single eternal calendar of myth and archetype. Participation adds something to the frames on the right side which is lacking in the frames on the entropic side. The Holotrophic Frames present a different kind of nesting which can be thought of as vertical rather than horizontal. . There is an elaboration of significance and awareness made possible by narrative continuity of experiences (time) which cannot be translated into structures across space. Regardless of how complicated a physical form or function becomes, it is still less miraculous than something like a flavor or a color, which defies mechanical explanation. A universe which contains humans presumably contains the potential for experiences which are more fantastic and more awful than a universe of only simple organisms or inorganic mechanical systems. This view shows the flow of significance being pulled from the right into the center, and pushed from the center out to entropy on the left. This is only one example of different ways of playing with the elements of the formula that can reveal new insights. Below is another diagram following the previous one, only marked up with some of the symbols used in the formula. This is quite interesting. Time emerges in retrospect. Vitality by remembrance repetition delay. Sense information ecology. Crazy enough to be true.